Subsidiary prints appear on the lid, spout and below the spout. 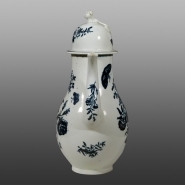 This Lowestoft coffee pot is printed with the Three Flowers pattern copied from Worcester. The base also bears a copy of the Worcester crescent mark. The pot and lid have simple two-line painted borders.